Jay: Welcome to New York. This photo is totally about gesture. Look at his expression. Look at how he has forcefully positioned his arm. Look at how he is separated from everyone else—by focus, by the lighting, by being the only male, by not being engaged with everyone else at the table. He is a New Yorker. How did you get this one, yell look like New York? Me: Just saw it and shot it. Didn’t think about it. Jay: Good, leave the thinking home more. Camera settings: Nikon D3, Nikon 28-300mm f/3.5-5.6 at 250mm, ISO 1,600, f/5.6 and 1/350th of a second. I also attended Jay's workshop a few years ago. It was the best investment I ever made in my photography. Your write ups are spot on. I read them and sit back and recall some of his comments during my workshop. You have captured Jay. I must admit that your shots are considerably better than the ones that I got during the workshop. I found capturing everything in camera to be extremely hard. Looking over your 100+ street photography photos I think you have a gift for this type of photography. Keep the series going. Did enjoy. You have stereo typed my city. But, it is true. 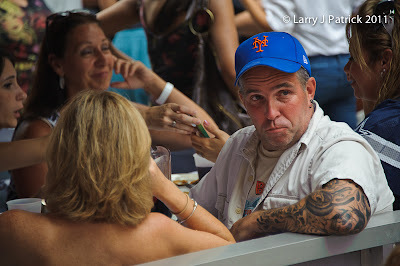 You see a lot of guys just like this one and think, he is a New Yorker. Enjoyed a Texan showcasing the Big Apple. Stereo type or not. This is my NYC. Go Mets. Does the new found freedom from processing sit well with you, or are you struggling with leaving them as shot? Obviously, getting it right in camera is a challenge to most photographic minds and one that Jay takes to heart. Will that concept stick with you as you move on, or will it just be another tool in your pouch to use if needed? There is a great deal of variety in your street photos. Is that because of Jay's assignments? What did you learn? Is this how Texas sees New York. If so, that explains so much about how backward your state is.